Bramble Hollow Farm is proud to feature several heritage breeds of livestock for our customers. What are heritage breeds? They are the 'oldies but goodies' of livestock- the chicken your grandmother used to talk about and the pork she remembers from her childhood. These are breeds that retain the historic characteristics that are no longer available in commercial breeds. Some of these characteristics are: the ability to reproduce naturally, a longer lifespan, and a more natural weight gain and distribution. These traits combined with a natural diet of pasture grasses, clovers, and forest mast produces more traditional-tasting, rich and flavorful meat. Unfortunately many heritage breeds are in danger of disappering from farmyards forever. As agriculture has become more industrialized the uniqueness of heritage breeds has been traded in for breeds of more uniform size and weight with quicker maturation times. Small farms are often the only places you will find these old, hardy breeds. To support the efforts of many heritage breed farmers, we are members of the American Livestock Breeds Conservancy. Our pastured porkers are Tamworths, a heritage breed of hog recognized by the American Livestock Breeds Conservancy as a threatened species. The breed was developed in England and Ireland in the early 1800’s. Sometimes called an Irish Grazer, the Tamworth is a great breed for foraging in open pasture and wooded areas. These hardy animals do well in colder climates and their tough skin and wiry hairs help defend them against the cold winds of winter. They do not perform well indoors which is why this breed lost its popularity as pork production was moved from individual farms into confined animal feeding operations in the 1900's. 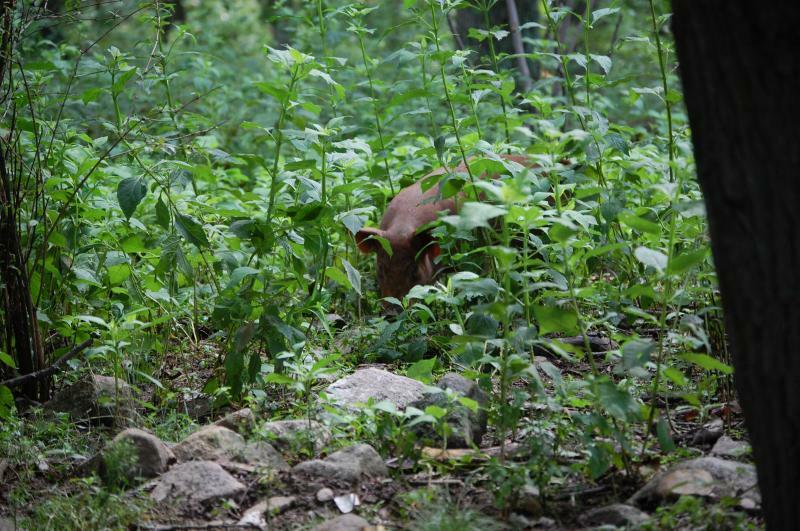 In addition to access to pasture, our Tamworths now also graze in a forest paddock where they can root for tubers, pick through forest litter for nuts, treefruit and bramblefruit, and wallow in the cool water of a small stream. These hogs are living the good life! 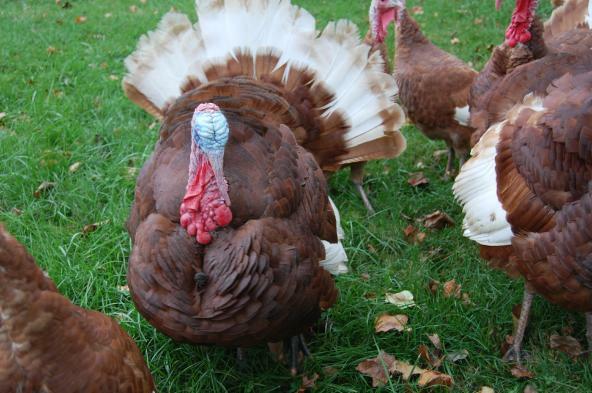 If you've never tasted a pastured, heritage breed turkey, then you are in for a real treat. The flavor of the meat is nothing like the dry, tough stuff you're used to. We’ve chosen to raise Bourbon Red, Narragansett, Black Spanish and Chocolate turkeys in 2014 because of their beautiful plmage, great disposition and their unbeatable flavor. We’re also proud to be bringing attention to several breeds recognized by the American Livestock Breeds Conservancy as threatened and priority watch status. Heritage breed turkeys, unlike the broad-breasted white turkeys used in commercial production, can mate naturally. They are slow growers and require about 2 months longer than commercial breeds to grow out. Heritage breed turkeys weigh between 8 and 15 pounds dressed for your table. Our turkeys are brooded inside until they feather out at about 10 weeks. Then they are on pasture for the next 6 months. 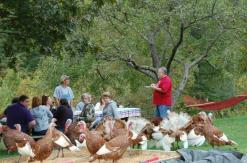 The turkeys are free-ranging during the day and are protected by poultry net while they roost at night. 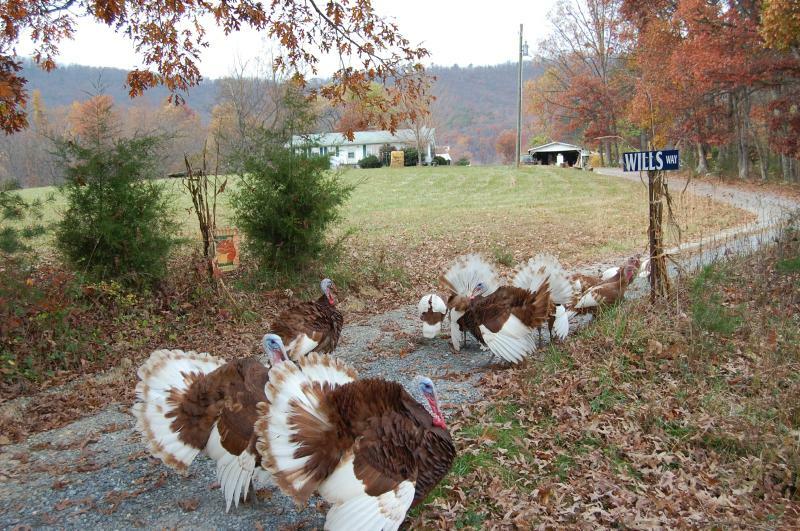 Last year, the turkeys had run of the farm on several occasions, once venturing .25 miles from home in search of wild persimmons, acorns, hickory nuts and other autumn goodies. For 2014 we are trying a Tamworth/ Black Hog cross. We're excited to be trying something new and will post pictures of the pigs on our Facebook page. Click here for more information about ordering custom pork from the farm. 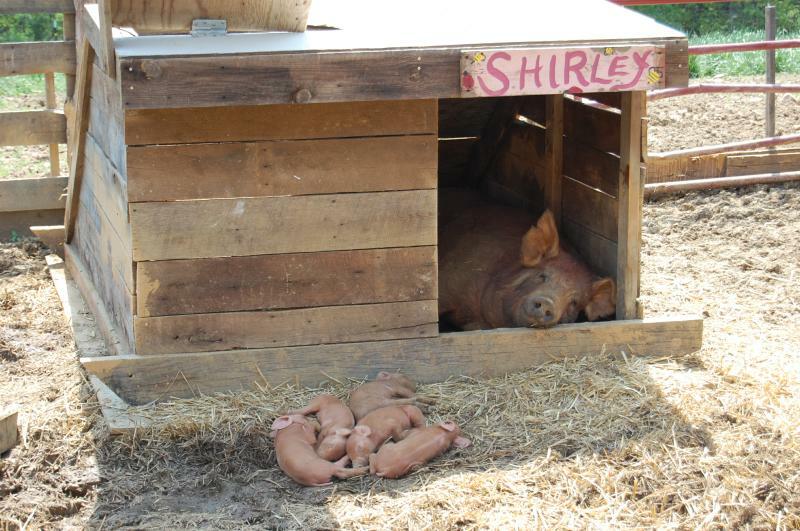 Shirley nurses her day-old piglets in her outdoor farrowing hut. 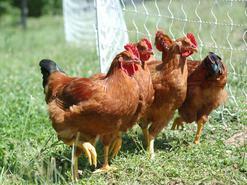 We proud to be the only farm we know of to feature true heritage breed chickens. Plymouth Barred Rocks are our current breed of choice. For more information about our exciting new offering please visit the News From the Farm page. We also offer a breed of chicken called the Freedom Ranger chicken that is not a heritage breed chicken, but is a breed derived from French and American heritage breeds and was developed in the 1960's to meet the strict culinary standards of the French Label Rouge Free Range program. 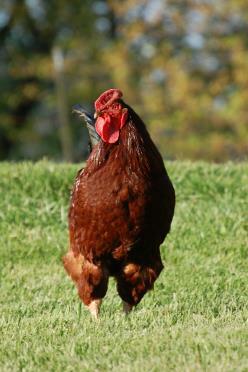 These chickens retain many of the natural instincts and behaviors of heritage breeds. 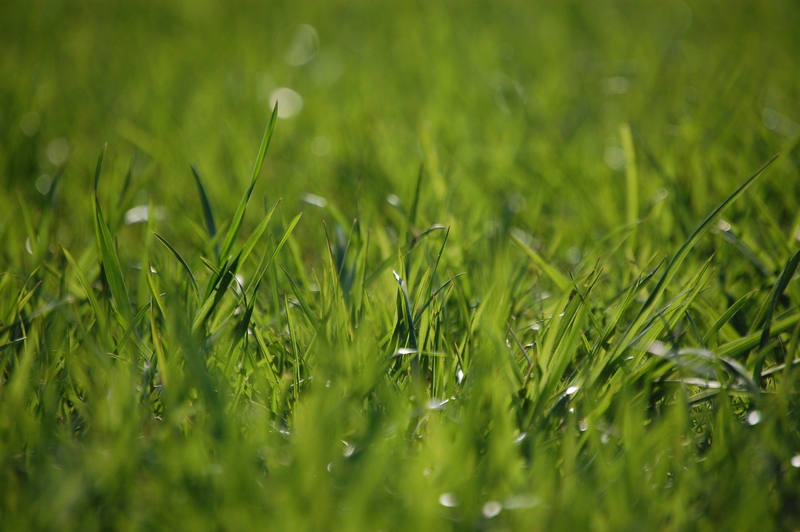 Thus they are great foragers and often prefer the grubs and pasture grasses to milled grain. These chickens range far and wide to find water, shade, a nice dust bath and great forage. As a result these chickens have a dark meat, more traditional-tasting flavor and smaller breasts and legs. Because of their heritage breed derivation, these chickens take a few weeks longer to reach market weight than Cornish Cross broilers. We think the wait is worth it!